The expanded Robins Stadium will be a permanent multi-sport venue serving the University's football, lacrosse, soccer and track & field programs. The expanded facility will be located entirely within the University's existing boundaries and will be placed at the site of the former First Market Stadium. There will be no encroachment on area neighborhoods. The proposed capacity of the stadium is for a maximum of 8,700 spectators. To put this in perspective, the expanded First Market Stadium will have a seating capacity less than the current capacity of Robins Center (9,071), which serves as home to our men and women's basketball teams. As a state-of-the-art athletic venue, Robins Stadium will strengthen the University of Richmond and represent an important new asset for the City of Richmond and the entire region. Unlike other proposed projects in Richmond, there is no cost to the City or its taxpayers for the University's Robins Stadium expansion. It will be built entirely with private donations and University funds. The Robins Stadium expansion has been carefully planned to minimize impact on the surrounding communities, and to further enhance the University's national reputation for having one of the most beautiful campuses in America. The University of Richmond is an important cornerstone of the region's economy and a key contributor to Richmond's culture and quality of life. With more than 1,500 employees, the University accounts for more than $450 million in local economic activity on an annual basis. In 2003, a state-of-the-art track surface was installed at the Stadium and dedicated in honor of legendary track & field head coach Fred Hardy. Hardy, a member of Richmond's Athletics Hall of Fame, coached the Spiders track and field squad for 35 years (1950-85). Hours (General Information): • The expanded Robins Stadium will be a permanent multi-sport venue serving the University's football, lacrosse, soccer and track & field programs. • The expanded facility will be located entirely within the University's existing boundaries and will be placed at the site of the former First Market Stadium. There will be no encroachment on area neighborhoods. • The proposed capacity of the stadium is for a maximum of 8,700 spectators. 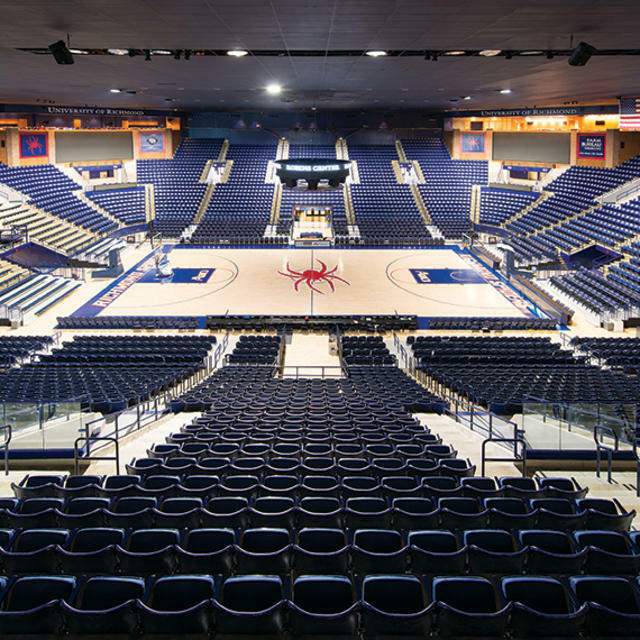 To put this in perspective, the expanded First Market Stadium will have a seating capacity less than the current capacity of Robins Center (9,071), which serves as home to our men and women's basketball teams. • As a state-of-the-art athletic venue, Robins Stadium will strengthen the University of Richmond and represent an important new asset for the City of Richmond and the entire region. • Unlike other proposed projects in Richmond, there is no cost to the City or its taxpayers for the University's Robins Stadium expansion. It will be built entirely with private donations and University funds. • The Robins Stadium expansion has been carefully planned to minimize impact on the surrounding communities, and to further enhance the University's national reputation for having one of the most beautiful campuses in America. • The University of Richmond is an important cornerstone of the region's economy and a key contributor to Richmond's culture and quality of life. With more than 1,500 employees, the University accounts for more than $450 million in local economic activity on an annual basis. • In 2003, a state-of-the-art track surface was installed at the Stadium and dedicated in honor of legendary track & field head coach Fred Hardy. Hardy, a member of Richmond's Athletics Hall of Fame, coached the Spiders track and field squad for 35 years (1950-85).